We’ve had a slight epiphany about Nuneaton. After a more extensive walk around the town much of it is very nice. However we still have two concerns. The most obvious is the large quantity of dog faeces along the stretch of towpath most used for mooring. The second is the rather restricted access to the town from the moorings. Today’s 15km walk though the local countryside was rather interesting, despite the occasional light shower. The route took me down the Coventry Canal to Marston Junction and then up the Ashby Canal. We haven’t been up the Ashby and it looks rather interesting. The route then cut across the fields via public footpaths to reach Nuneaton where I shopped for some essential food items before returning to Waiouru. Dear Reader, it is at this point that I need you to close your eyes and visualize all the beautiful photos I took during the walk. Tranquil canal scenes. Still water with overhanging trees and a quaint brick arch bridge in the distance. Buttoned down boats with wisps of smoke drifting from their chimneys. Newly ploughed fields and the small grey squirrel whose curiosity got the better of him. He approached within a metre of my feet to examine my face (well actually the camera lens). Much enjoy your blog but please tell me how to get those super maps. The Canal Maps showing facilities, etc are based on Memory Map and are the property of Paul Balmer (nb Watereway Routes). These are the maps I used to navigate (by gps) around the network. 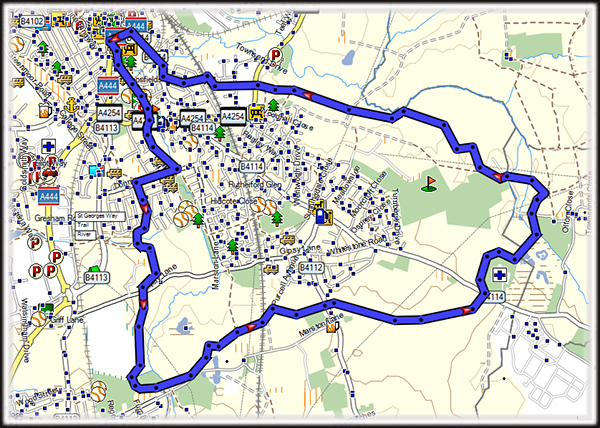 The maps of the countryside are a free version of the Garmin topo maps using the data from the Open Street Map. It's this map I used today. I should probably write a post on how to set up the free maps on a pc. I know little about digital cameras, even less about super-whizzy ones I imagine yours is, but could you not have simply removed the memory card and put it into your computer to access the photos? The Ashby is gorgeous! We spent our second honeymoon on it (our first was a three day sin Seattle and Tacoma, WA before returning to England in 2011). It is one of my favorite places hands down. I love Stoke Golding. One can easily catch a bus to Morrisons about 10 minutes away. Everyone in the village was friendly and helpful to us. It's a great place to get mail Post restante. The post mistress' partner is a boater. The White Swan pub in the village serves delicious food too. No locks and quiet tranquil scenery for much of the Ashby. You won't be sorry to see it although I'd check the winter stoppages coming up soon. With regard to Nuneaton--we think you are brave to moor up there for more than 10 minutes! Glad you and Jan got away unscathed. We will probably cruise the Ashby this winter. No locks so hopefully no stoppages!